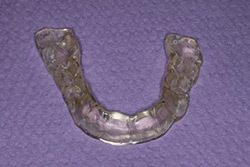 Nocturnal grinding, also known as sleep bruxism, is the result of excessive grinding or clenching of the jaw during sleep. It isn’t fully understood why patients grind their teeth at night, but some suggest the reason for the uncontrolled grinding or clenching could be related to factors involving stress, alcohol consumption and a handful of other variables. It is also highly likely that the patient may suffer from an abnormal bite, crooked teeth or missing teeth. Because of the nature of the problem, it is common for nocturnal grinding to result in tooth wear and other more severe physical and mental strains. In some cases, teeth grinding at night can fracture or loosen teeth, subjecting the patient to costly restorative measures such as root canal treatment, dental implant treatment and the need for crowns or bridges. When it comes to nocturnal tooth grinding, we will likely prescribe you with a custom made mouthguard to assist in the protection of your natural teeth. This apparatus will allow time for your symptoms to settle and offer a chance for you to fully recover any lost sleep and other detrimental health issues associated with night-time grinding. If needed, your dental professional may trail a handful of possible solutions you might benefit from such as a regular exercise routine, stress counselling or lowering your caffeine intake in order to determine the underlying behavioural problem.